In my previous articles I have explained you, what are the basics of SEO for photographers. On Page SEO includes Image optimization,Title Optimization,Best WordPress SEO Plugin,Link Building and importance of Social Media Sharing. Today I will tell you about why should we opt for Mobile responsive site. What are the benefits of having responsive site and why it is consider as a key factor for your Photoblog's SEO. What is Mobile Responsive Site ? A Responsive Website, means a website layout and content adapts based on the size of the screen on the device which the website is opened. In simple terms Website site layout should be flexible enough to fit into any possible screen resolution and Responsive design of website automatically adjust the device's screen size. 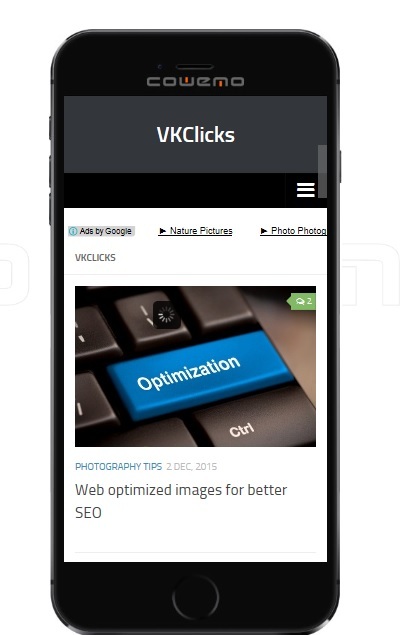 My website VKCLICKS is a Mobile Responsive site. As you can see below the screen gets smaller, the content and design changes to the display for user’s screen resolution. Mobile Responsive Site will give best experience possible to your regular visitors. I am using Hueman wordpress theme for my blog to make my photoblog design responsive. Why do you require Mobile Responsive Site ? As we know using internet on smartphones and tablet are rapidly increasing, plus it is also a modern day requirement. As per the research internet usage on mobiles are increasing massively. So it is very important your site should be Mobile Friendly and Responsive to become your website future proof. A Mobile Responsive Site will provide a good user experience to your visitors on any device and any screen size. Responsive design will optimize your website and increase your website traffic. For these reasons, Mobile Responsive site is also plays vital role on your photoblog's SEO.